Zint Collagen is comprised of both type 1 and 3. Type-1 collagen is the most prominent matrix of protein in the skin and is responsible for making skin firm. Type-3 collagen is found in human tissue, giving skin its plumpness and soft texture. As we age, the stronger type-1 collagen gradually replaces type-3 collagen, and the skin begins to lose it youthful properties. 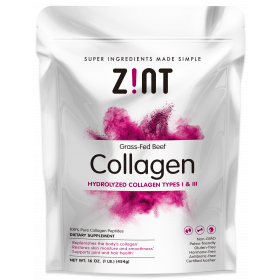 I am a 64 year old woman and began purchasing and using Zint Collagen Hydrolysate several months ago. I had read that the collagen boost may help my aching joints. To this day, I am not certain that my joints actually feel any better, however, I received an unexpected benefit of a very smooth complexion and fewer noticeable wrinkles. My whole life my skin has been on the blotchy side; very uneven skin tone with patches of roughness and dryness. After only a couple of weeks using Collagen Hydrolysate, I noticed a huge difference in the appearance of my skin and friends have commented on the smoothness. I am 100% hooked on this product and I use it diligently every single day; sometimes twice daily. I typically add 2 heaping tablespoons to 8-10 ounces of tap water and stir until dissolved. It doesn’t taste great by itself, so I usually add a smidgeon of juice or some sort of flavoring just to give it a little better taste. For me, this truly has been my “silver bullet” in terms of improving my complexion. Too bad I had to wait 64 years to discover it. Better late than never though!